At Advanced Hand Rehab, we have a staff of highly skilled occupational therapists and certified hand therapists that are available at all our clinics. Hand therapy is the art and science of rehabilitation of the upper extremity or limb. This includes the hand, wrist, forearm, elbow and shoulder, which may not be functioning properly due to any number of problems. 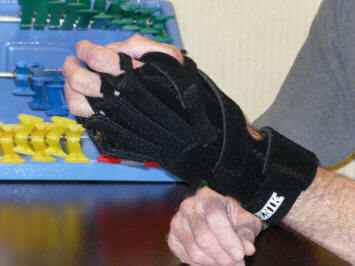 Hand therapy is considered to be a specialized area of physical and occupational therapy. Injuries to the upper extremities can be complex, involving bone, tendon, nerve and/or skin. Recovery is equally dependent upon expert physician care and early, appropriate hand therapy. Many times, a splint is required as a part of the patient’s rehabilitation. 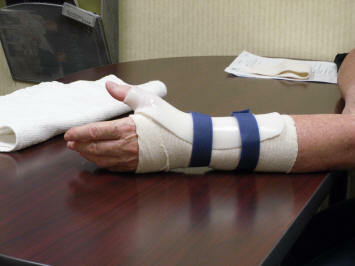 Advanced Hand Rehab provides state-of-the-art, customized splinting and offers same day service. Our hand therapist can fabricate many different types of splints depending on the patient’s needs. We can make custom static splints, as well as custom dynamic splints. We can also fit prefabricated splints that can assist with the correction of deformity and improving independence with activities of daily living for conditions, such as rheumatoid arthritis and osteoarthritis.